I may not be doing round ups anymore but you can bet I’ve been seriously pouring over the red carpet photos from the 2016 Met Gala held this past weekend in New York. This year’s theme was (arguably) the easiest (and least controversial) in years. The Gala celebration for the opening of the new Manus x Machina exhibition at the Metropolitan Museum of Art meant attendee’s were expected to honour the bridge between technology, fashion and the future. The exhibition itself not only celebrates the obvious advances in wearable technology, but the future of the clothes manufacturing process itself, sustainability, and fashion’s influence on social (and visa versa). Between the multitudes of Blade Runner inspired gowns, metallic accessories and silver make up there were a choice few really awesome pieces that stuck out and perfectly manifested the theme for me. I think it’s fair to say if there was one woman who captured the attention of everyone at the Gala it was Clare Danes. Her Zac Posen gown was utterly captivating as it stood on the red carpet, flip the light switch though and it escalated to a whole other level of awesome. 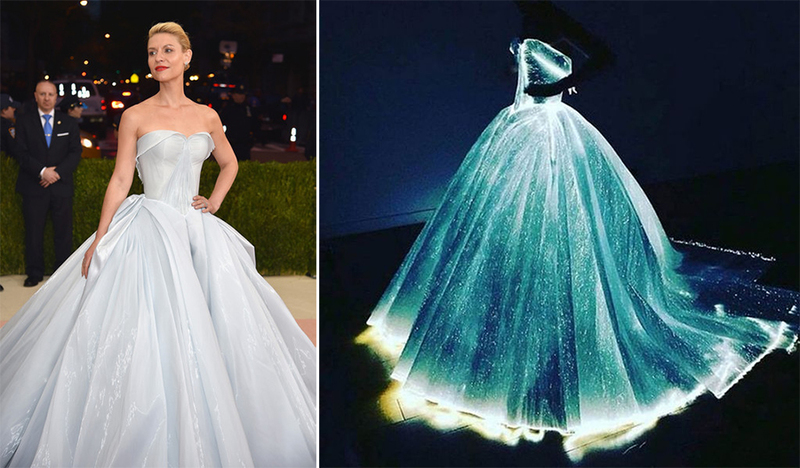 The gown itself was fitted with LED lights, which fed into fibre optic woven organza (battery packs were skillfully hidden in the side of the dress) giving off a stunning luminescent blue glow. A real life Cinderella moment aided by wearable tech. Also taking on the tech theme was model Karolina Kurkova who’s gown designed by IBM Watson and Marchesa also showcased a beautiful light show. Like Clare’s gown it was in itself beautifully made for the red carpet. The added detail this time was a train of dainty ‘cognitive’ flowers. The conductive fabric which was also embedded with LED lights that changed colour based on the reaction of Kurkova’s Twitter followers, picking up emotions like joy, curiosity and excitement. I almost missed Allison Williams’ look. Her Peter Pilotto gown showcased the current hottest trend in fashion technology, the beaded blue flowers adorning her look were all 3D printed! Not only is the gown beautiful (and super Summer-y) but it’s a lovely showcase of how technology can be built into fashion in a very subtle way too. The Gala theme may have been heavily focus on technology itself but as I mentioned when talking about the future of fashion, it would be ignorant to ignore the issue of sustainability. Emma brought the conversation to the red carpet in her sustainable ensemble, made possible by fast fashion retailer H&M. The custom made gown was crafted together out of recycled materials – the train itself is made of plastic bottles. The great thing about the gown is that Emma could pretty much wear all the pieces again. The skirt could be whipped away revealing comfy trousers and the corseted bodice was detachable too. Young Hollywood has always been present at these kinds of events, but it seemed even more poignant alongside this year’s theme. From rising social media stars like Gigi, Kendall, Kylie and Zayn, to the next generation of social justice warriors in Grimes and Amandla Stenberg, to the Smith siblings championing gender-neutral fashion choices, for me If we wanna talk the future and fashion it would be impossible to discuss without looking at who will be carrying the banner in pop culture not just in terms of embracing technology but the future of what fashion will become on a social level too. Let me know in the comments which were you favourite tech/fashion hybrids from the night were!